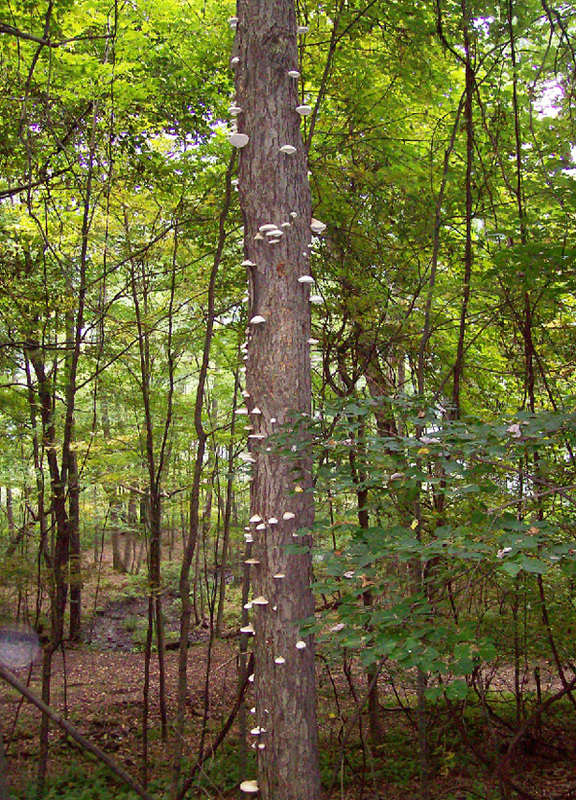 If you out-and-about in the summer through early fall on mushroom forays you will likely come across trees with sprouting white nubbins all over them. Those nubbins will have a soft solid feel, sort of like a hard marshmallow, and have a spore surface underneath that is white with thousands of very small holes - hence - polypore. Pore surface is that depression in the photo. Pores are so small they are hard to see without a hand lens. If it looks like the photo below it is a pretty sure sign that the tree is some type of birch and that the tree has seen better days. More than likely those little white nubbins are young Piptoporus betulinus buttons. The upper surface is just a bit hairy / fuzzy and, when young, is dingy whitish. Very light cream color on outer fringes and starting the brownish coloration near the attachment to tree. Later in the season the little nubbins get to become pretty good sized. Their upper surface start to turn brownish. 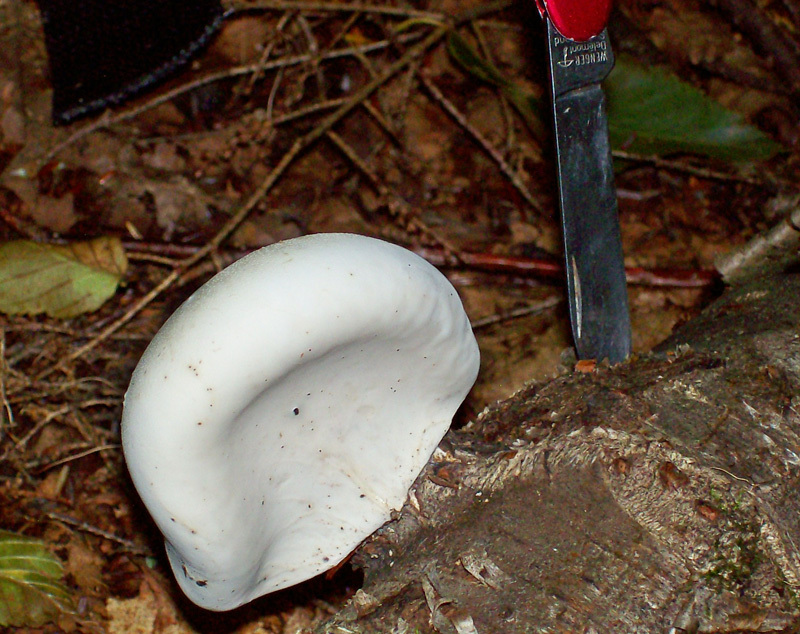 However, as long as it is a current year mushroom it will more than likely still be in pretty good condition. Some field guides say that if collected very young they can be palatable ( pleasant to taste ). Not so in my area of southwestern Pennsylvania. The little nubbins, no matter how young, cook up to have a bitter taste. Definitely not pleasant to taste. Yet, it is one of the few mushrooms that I use / consume every day - and I literally mean every day, and sometimes along with Turkey Tail and Chaga, as long as my supply does not run out. I harvest several hundred every year. I wash them off ( scrub ) real good, slice them into slivers about 1/8 inch thick and dehydrate them in my Nesco dehydrator. Sort of like the size of a slice of bacon. I use the dehydrated mushrooms for making a decoction, usually a quart at a time. I keep the quart in the refrigerator and use about 4 ounces every morning mixed with an equal amount of Original V8 vegetable juice. Mixed with V8 there is no hint of the bitterness. In that way I get the vitamin benefit of the vegetable juice and the medicinal constituents of the mushroom. I use this mushroom, along with others, to maintain my immune system and for general good health. After years of daily use I really miss it if I skip a morning for whatever reason. 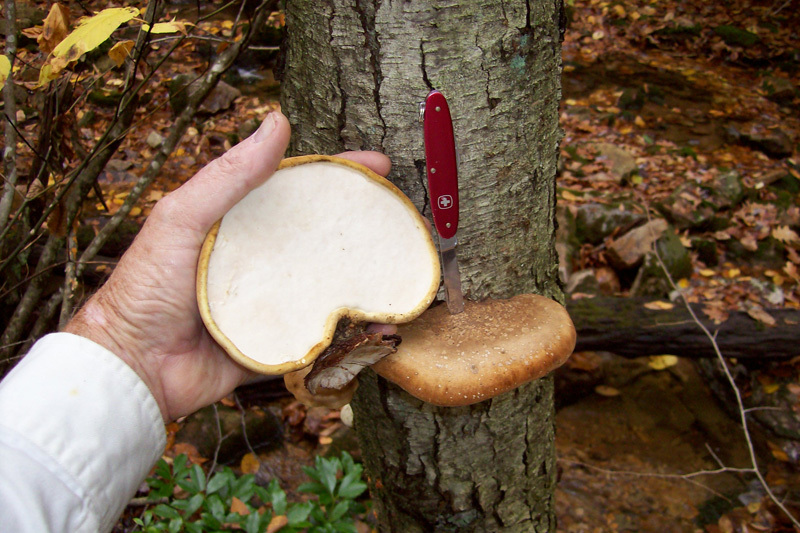 In addition to use as a medicinal brew another of the birch polypore preparation uses is as slices that are used in conjunction with bandaids or medical tape whenever I cut myself. Just a little piece under the bandaid is all that is needed. Change bandaid daily. The common name for P. betulinus is birch polypore. These mushrooms are generally specific to various birch trees. However, nature has a way of creating exceptions. It has been shown in the lab that birch polypore spores can be inoculated into other tree wood and thereafter grow in culture so it is not unlikely that, on rare occasions, these mushrooms might be found growing on some other tree hosts. Woodpeckers can flit about from tree to tree inoculating spores without knowing it. Bear scratchings, boring beetles and other animal or insect damage can inadvertantly innoculate the spores into other host trees. However, most always you'll find them on birch. Finding a tree with several of these mushrooms is an extra bonus. 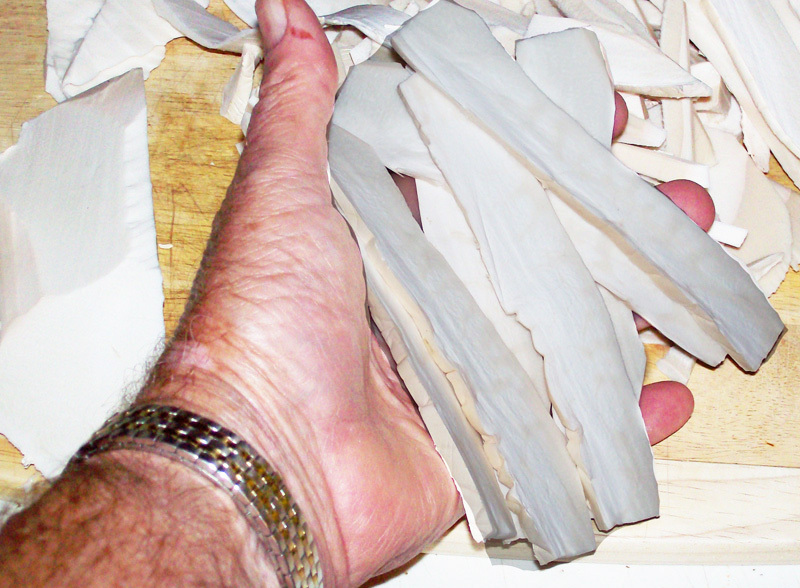 The mushrooms are easy to cut from the tree and are not so dainty that they must be handled gingerly. A bounty of Piptoporus betulinus on a standing black birch. If you are into medicinal mushrooms then this is another to add to your list. 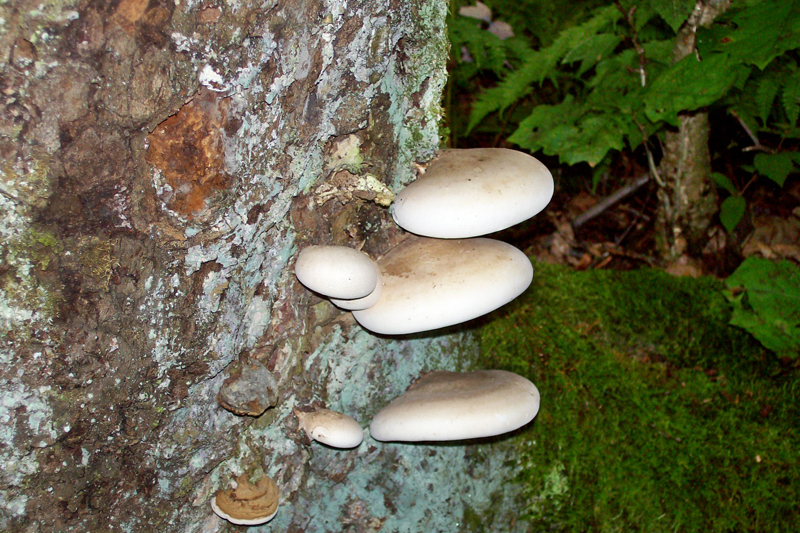 Research has shown that the birch polypore has many qualities beneficial to health. Prehistoric man was even aware of the birch polypore's medicinal benefits. Piptoporus betulinus / Polyporus betulinus. Birch Polypore, Birch Conk, Razor Strop Fungus. In Japanese - Kanbatake. DATE - Persistent all year. Pick only those fresh ones from the current year - late summer to early fall. FOUND - In the bigger woods in the Forbes Forest of Westmoreland / Fayette / Somerset Counties. Other big woods areas. Look in areas where there populations of birch. The birch can be any variety and, since there is not an over abundance of paper birch in southwestern Pa., you are likely to find these growing on any other variety of birch in this area. It seems that I find them more often on black birch (Betula lenta ) but that may be just a deception. Probably because the contrast of their whitish features and the trees dark bark makes them easier to be spotted so I find them more often.